Where Does a Nurse Manager Work? A nurse manager directs, supervises, and leads the nursing staff of a hospital or medical facility. The nurse manager's role is fast-paced, multi-dimensional, requires organization and critical thinking, and is vital to patient care as they oversee the nurses that provide direct care. They must have excellent skills in both nursing and business-related tasks, including coordinating schedules, managing budgets, and handling personnel matters. Since nurse managers must supervise other nurses, natural leaders and those who enjoy helping others succeed are well-suited for the role. Having experience in a wide variety of nursing styles is also a good trait to have, as nurse management positions may open up in any number of nursing units. Strong leadership skills, excellent communication, and an interest in the business side of nursing are must-haves for this career path. What Are the Education Requirements for a Nurse Manager? 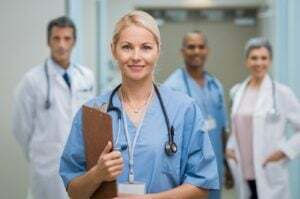 In order to become a nurse manager, an individual must first attend an accredited university or college and graduate with a Bachelor's Degree in Nursing (BSN). The nurse must pass a board exam called the NCLEX-RN to receive a nursing license. After this has been completed, the nurse must obtain experience in the form of direct patient care, ideally in an acute care setting such as a hospital. Length of experience is variable, though many employers will require at least 5 years' experience for this type of role. Many nurse manager positions promote and hire from within the staff nurses if there is interest. The next step in this process is to obtain a Master of Science in Nursing (MSN) or Master's in Healthcare or Business Administration (MHA/MBA). For some nurse manager positions, this step is optional, though highly desired. Learn about post-master's nursing administration/management certificate programs and MSN in Executive Nurse Leadership programs. Certified in Executive Nursing Practice (CENP): This certification is geared toward nurse leaders working in nurse executive positions. The requirements to obtain this certification include: active unrestricted RN license, master's degree with two or more years experience in a executive nursing role or a baccalaureate in nursing and four years of experience in an executive nursing role. There is a fee and nurse must pass an exam to obtain certification. Certified Nurse Manager and Leader (CNML): This certification is geared toward nurse leaders in a nurse manager role and is offered in collaboration with the American Association of Critical-Care Nurses (AACN). The requirements to obtain this certification include: active unrestricted RN license, BSN degree or higher with two or more years experience in a nurse manager role, or a non-nursing bachelor's with three years of experience in a nurse manager role, or an associate's degree with five years of experience in a nurse manager role. There is a fee and the nurse must pass an exam to obtain certification. Nurse managers are typically found in hospitals where they oversee and manage nursing staff on a specific unit or specialized floor. They may also be found in ambulatory care centers as well as long term care centers where they may manage nursing staff working in different areas of the facility, such as a nursing home or assisted living center. Nurse managers are a vital component of any healthcare setting. They are responsible for supervising a nursing unit in a hospital or clinic. That includes direction of nursing staff, oversight of patient care and some management or budget decisions. In other words, instead of spending their day screening patients and checking vitals, they are establishing work schedules, coordinating meetings and making personnel decisions. What Are the Roles and Duties of Nurse Managers? A nurse manager's salary will vary depending on setting, experience, and other factors. The national average salary is $79,725 per year, though the range is from $59,212 to $108,478. Typically, a higher salary for nurse managers can be found in hospital settings, particularly in fast-paced Intensive Care Units. Due to the extensive experience requirements to become a nurse manager, many enter nursing management and tend to stay. There are further opportunities for nurse managers within leadership, including: nurse educator, director of nursing, clinical nurse specialist, patient care coordinator, and nurse case manager.